← She met the learning outcomes…but she doesn’t deserve to pass. Last week my wife and I were in Greece as I was presenting at the NESA Leadership Conference in Athens. As we arrived in the city, it became really clear that strikes had impacted the normal flow of people and services. 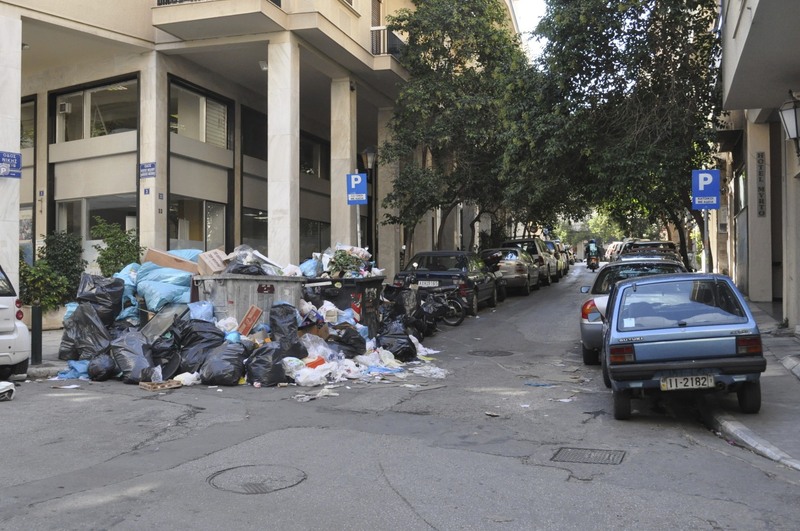 Garbage piles littered the city and many local attractions were temporarily closed. The taxi driver who brought us to our hotel explained to us on the 30-minute drive the many things that personally concerned him about Greece’s financial and political future. 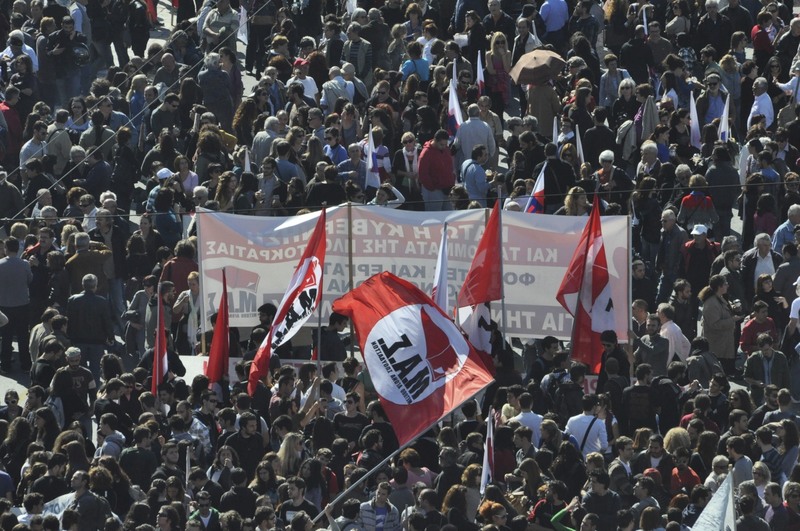 The austerity measures being considered by the Greek government in order to be eligible for European bail-outs were indeed opposed by many people. The next morning, on October 19, we decided to take a walk through the downtown, or Plaka, but we were warned that most stores and attractions would be closed and that there would not be public transit of any kind. 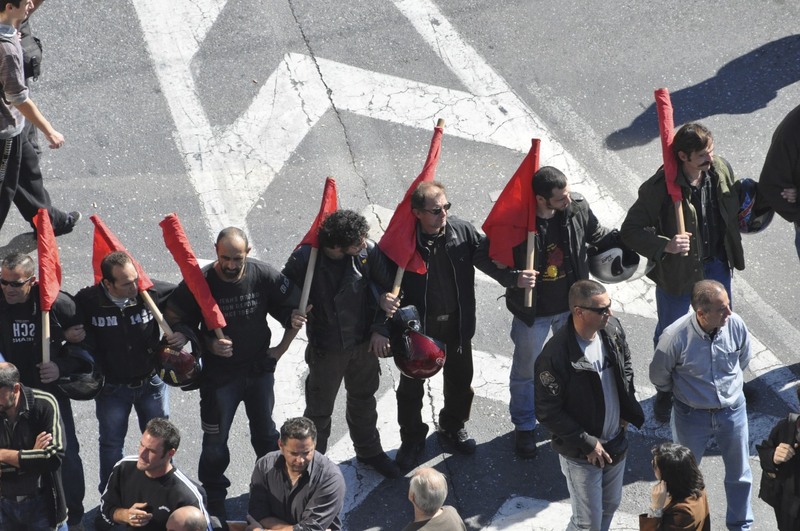 Athens was on a general strike. Furthermore, we were strongly encouraged to avoid the downtown areas were protesters were expected to gather. Both the hotel staff and the organizers of the conference warned us that violence was expected from some protestors. I have to admit that the social studies teacher in me yearned to walk close enough to the downtown area to at least gain a flavour for what large-scale public protest really looked like. For weeks I had followed the story on BBC World News, and I was drawn to take a closer look. As we walked towards Constitution Square, it was not hard to know the direction of the protests. Streams of people flowed through the narrow streets all heading towards the Greek Parliament buildings. Many people carried signs and wore common colours which I assumed represented their respective organizations. As we arrived at the central square we saw thousands of people standing around and chatting. There was a very casual feel to the crowd and to the groups of police and military personnel who occupied the government grounds. The tone changed slightly however, as around noon a lot of people began to arrive who were carrying large pieces of wood to which red flags were attached. Clearly the diameter of these ‘flag holders’ suggested that they might serve a dual purpose. Perhaps more distressing was the arrival of many younger protesters who were wearing black hoodies and carried motorcycle helmets and/or gas-masks. Noticing that a local hotel had a roof-top restaurant, we decided to head up for a better view. Once we were seven stories up we could see the protest taking shape. The vast majority of the people were setting up formation in order to march, whereas a separate group was beginning to clash with the authorities over by a barrier to the government buildings. The din of the crowd grew as more people arrived and this noise seemed only to encourage the more radical sect confronting the police. Over the next hour or so, we watched as the protesters laid siege to the crowd barriers. We watched people disassemble railings and proceed to throw the iron bars at the riot police. 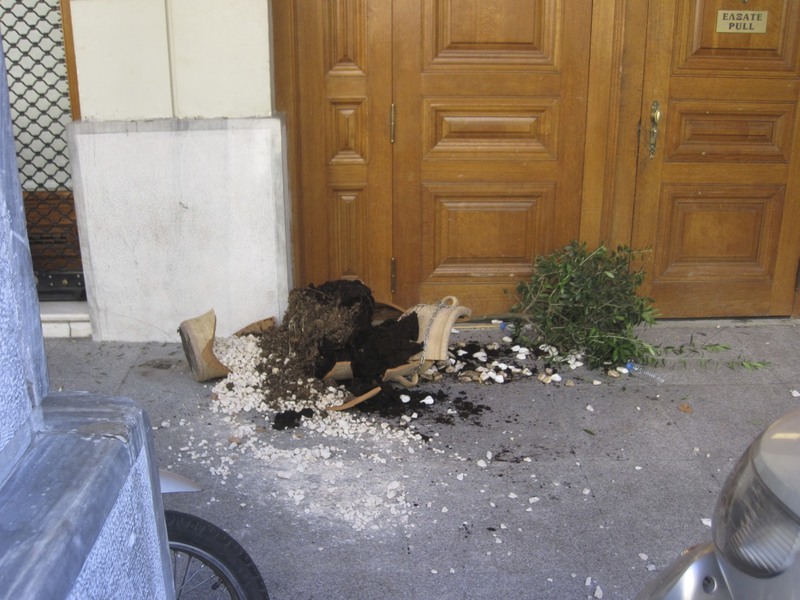 Large chunks of concrete were hurled through the air along with chairs, signs and Molotov cocktails. I could see people defacing walls with spray paint and I watched as a young man smashed a window with a metal bar, only to then hurl the pipe once the window was shattered. I was absolutely mesmerized at the sight, but at the same time I was distinctly saddened to watch so many people destroy a space that 2 hours earlier looked unscathed. The whole time I had been taking a lot of photos. After tear gas wafted up to our rooftop, and we understood why it is called ‘tear gas’, we were asked to leave the balcony area. Once inside I wanted desperately to get to the ground level to continue watching the protest and to get pictures from the street. Despite once again being encouraged by the hotel staff to just remain indoors, we asked to be let out of the hotel. The front lobby doors were barricaded with riot shields, so they escorted us down a hallway to a back alley. As we left out the back door, we found ourselves in a scene of chaos. In what would normally be a quaint alley lined with trendy coffee shops and stores, now burned large piles of rubbish. Many people’s faces were white from the tear gas and others forced themselves through the crowd carrying makeshift weapons. 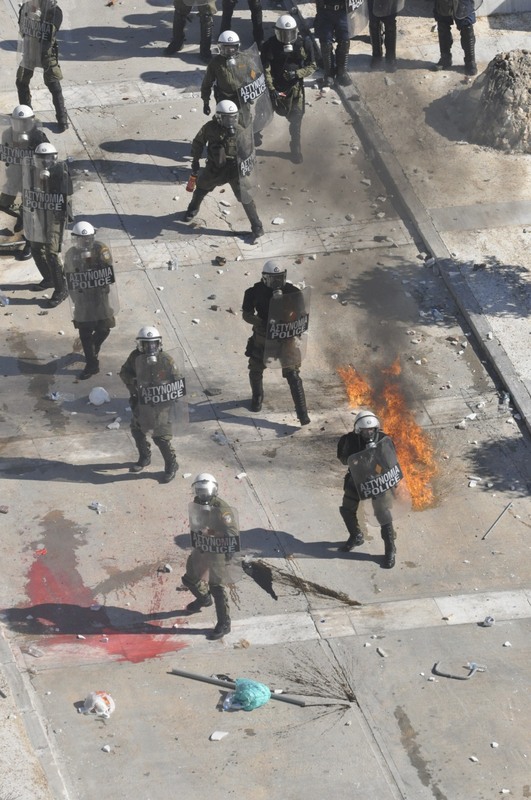 The explosions from the Molotovs were booming through the air as the smell and feel of tear gas was everywhere. Despite the scene, neither my wife nor I felt in any imminent danger, as long as we just blended into the crowd. Most alarming to me was that the courage I thought I had moments ago on the seventh floor of the hotel had vanished. Though I watched a protestor spray painting the marble wall of a bank, just steps from a police officer on a BMW motorcycle, I did not dare take out my camera to shoot the scene. I somehow sensed that if I were to start taking pictures something bad would happen. My wife took a few pictures with her miniature camera, and that is why we have a few pictures from that alley. We eventually drifted out of the downtown with thousands of others who felt they had experienced enough of the demonstration. After walking 4 blocks or so, I conjured up the courage to take out my camera and take a few pictures. It had been a remarkable experience. I have thought a lot about this event in the week or so since it occurred. I think I am still processing it, but a few distinct thoughts have emerged. I really respect and admire the journalists who each and every day bring us the stories from around the world where violence and danger abound. All my life I have watched scenes on the news of such events, and only when you really hear, see and smell the scenes found on the news do you get a sense for the contribution these people make to our understanding of world events. Not since sometime in grade school had I found myself in a position where I just wanted to vanish for my own good; the desire to just keep my head down and blend in. Fearing for one’s safety from the larger population, regardless of the reasons, is an experience worth feeling from time to time. I don’t know if it is too much of a stretch, but I did think of students, who for their own safety, drift through the school trying to remain unnoticed. Though they may or may not face physical violence, they do find it preferential to keep as low a profile as possible. I think it was good for me to feel this way too, even for a little while. This is an amazing story Myron. I find your analogy between the protests, and how you felt, and the comparison to kids in schools very interesting. I think sometimes that we forget what it feels like to be a kid navigating school hallways, and sometimes, we need to reminded.